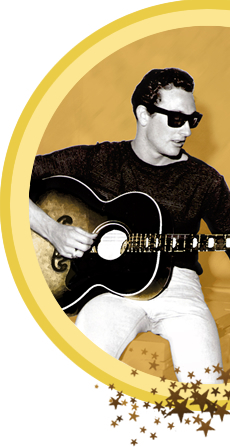 True to this spirit, Songmasters, in collaboration with Buddy Holly Guitar Foundation, will auction the one and only “Listen To Me” Holly Guitar through the famed Music Icons Auction held by Julien’s Auctions in LA in June 2012 to benefit the GRAMMY® Foundation’s Grammy Camps. Only a limited number of these unique, hand-built re-creations of Buddy Holly’s customized Gibson J-45 acoustic guitar and hand-tooled leather case exist. 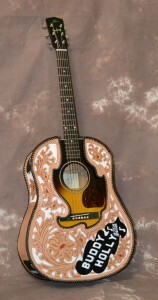 This guitar is more than a slice of music legend – it is a work of art and an extraordinary musical instrument. Of these, all but one of the Holly Guitars – this “Listen To Me” guitar – have been awarded by the BHGF on a long-term “legacy loan” basis to guitar icons and legendary performers such as Pete Townsend, Peter Frampton, Jackson Browne, and Graham Nash, among others. music – and musical legacy – lives and thrives. Read more about the J-45 guitar and Listen to Me program here. Read more about making of the guitar here.